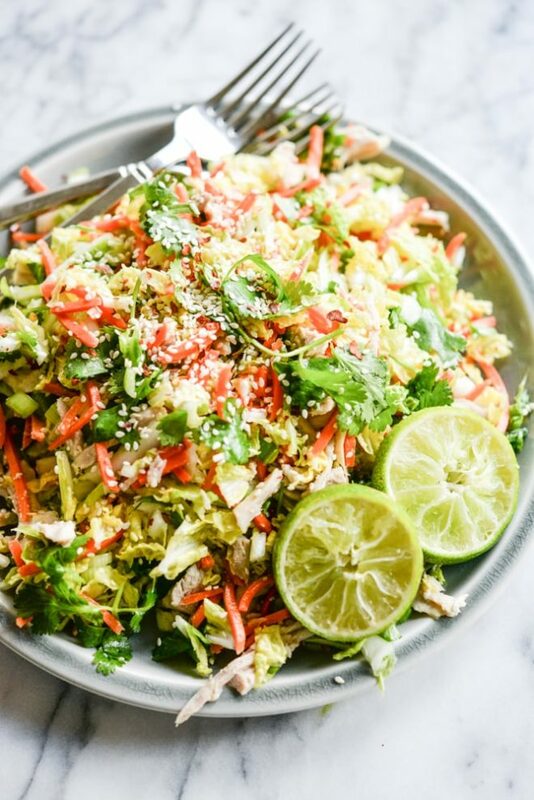 This Chinese Chopped Chicken Salad has a tangy ginger lime dressing, shredded chicken, and fabulous vegetables making for a healthy make-ahead lunch option! I'm writing to you from San Angelo, TX! Aside from the 10-ish minute drives we take to my parents house or to Gray's doctor appointments, this is our first time out of the house in nearly a month. I felt like throwing my head out the window on the drive to yell, “HELLO WORLD!” We ventured out with our 4-week old baby girl to visit Austin's home town for a weekend on the river ranch (where we got married). When we found out that we were expecting last year, our first order of baby-prep business was thinking about getting a new baby-friendly car. After a whole lot of research and reflection, we eventually settled on a Tahoe with captains chairs. We thought it would offer enough room for Gray, for me to ride alongside her in the back (while she's still so tiny), and for Gus in the back (seats folded down). We EVEN thought that we could grow into this car a bit more if we're blessed with siblings for Graysen in the future. Though I'm sure we'll get more efficient at packing as time goes on, we FILLED that car. Ha! I cracked up. Poor Gus had (what probably felt like) a shoebox to lay in between the baby gear and our bags. The car ride to San Angelo, one that we take 6-10 times a year, is usually a solid 3-hour drive. Our car is almost always abuzz with entertainment from either an audiobook or a podcast and we always stop halfway at our favorite rest stop so that Gus can stretch his legs . This trip, as you can imagine, was slightly different. It took us an extra 30 minutes (less than I thought) and there was no audio entertainment as I was mostly holding my breath, prepared for a meltdown. I was ready for anything. I had a pacifier in my pocket and Austin kept an eye out for good places to pull over, if needed. I'm thrilled to say that Gray made life easy on us this trip! We still pulled over at our favorite stop so Gus could stretch his legs, but also so that Gray could get in a snack. It could have been a fluke, but we may have an easy traveler on our hands! Now, this momma just needs to learn how to pack strategically so that Gus can have full reign of his backseat palace again. NOW, let's talk about this salad! I love a hearty salad with a lot of flavor and this Chinese Chopped Chicken Salad does not disappoint. 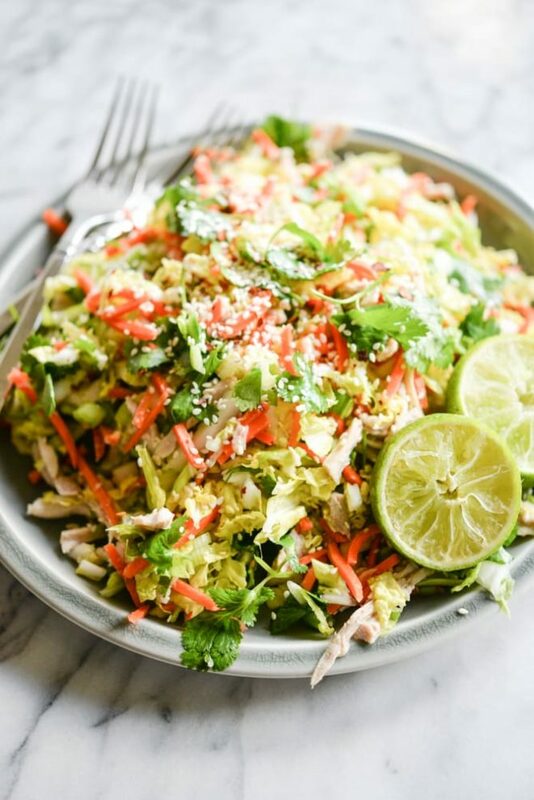 With a tangy ginger lime dressing, shredded chicken, cabbage, cilantro, and carrots, this makes for a robust lunchtime option. Note that this salad makes quite a bit – which is on purpose! I love this salad as a make-ahead lunchtime option. 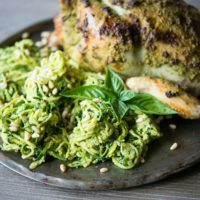 Though the general leftover salad rule of thumb is that you can't save a salad with dressing on it, this one is an exception due to the hearty cabbage. If anything, I think it gets even better. 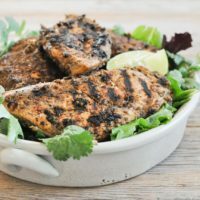 This Paleo Chinese Chopped Chicken Salad is bursting with flavor! 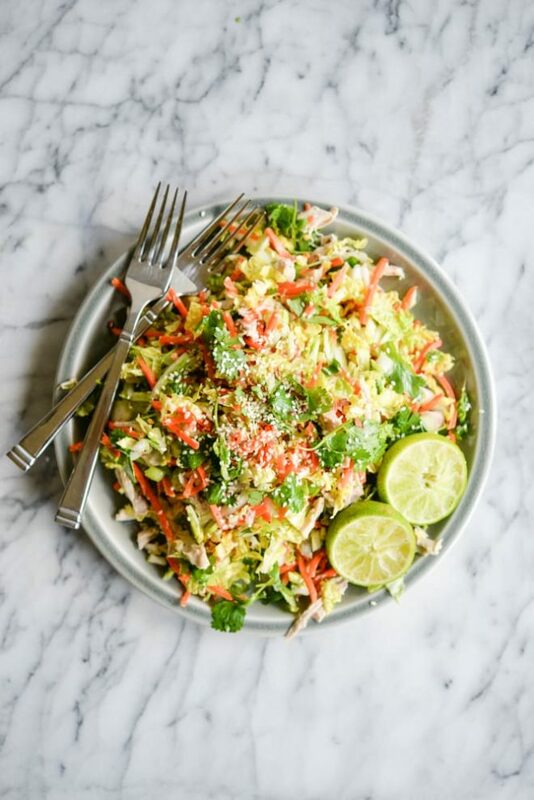 Shredded cabbage, carrots, and cilantro are tossed with the tastiest sesame ginger dressing for a sweet and tangy salad with a satisfying crunch. Heat a skillet over medium heat and add the ghee. 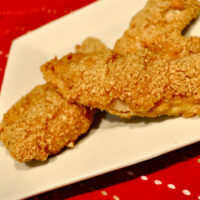 Pat the chicken dry then salt and pepper it and add to pan. Cook for 5-7 minutes per side, until browned. 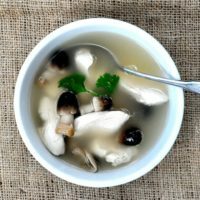 Remove from pan and let cool, then chop into bite-sized pieces. In a large bowl, toss the cabbage, carrots, green onion, cilantro, and chicken, then drizzle on the desired amount dressing and toss again. Enjoy!